On Friday we closed on our second home. We moved out of our first home in early November, and made ourselves at home in my parent's home while we waited for our new house's closing. Bless their hearts. It took a while to close on our new (old) house but it was so worth it in the end. It doesn't look like much on the outside, but it's keeping a lot of awesome secrets behind those doors. The house needs A LOT of love, if you know what I mean, and we plan to give it just that. 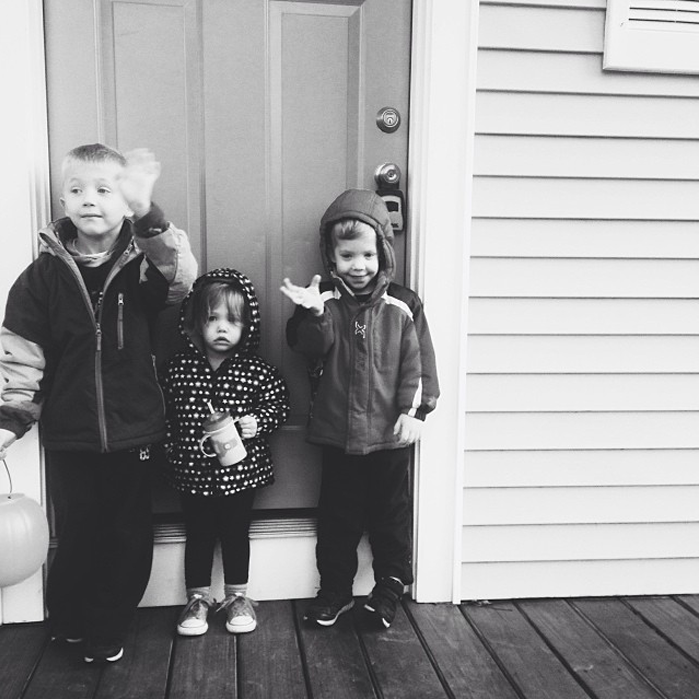 I miss and love our first house. All the work my husband put into it makes me so proud of him. We have so many memories there, we went into it with two babies, and left with two more. After we brought our son home in September I may have felt the walls closing in on me. Just a tiny bit. Six people was a little bit much in there, maybe. 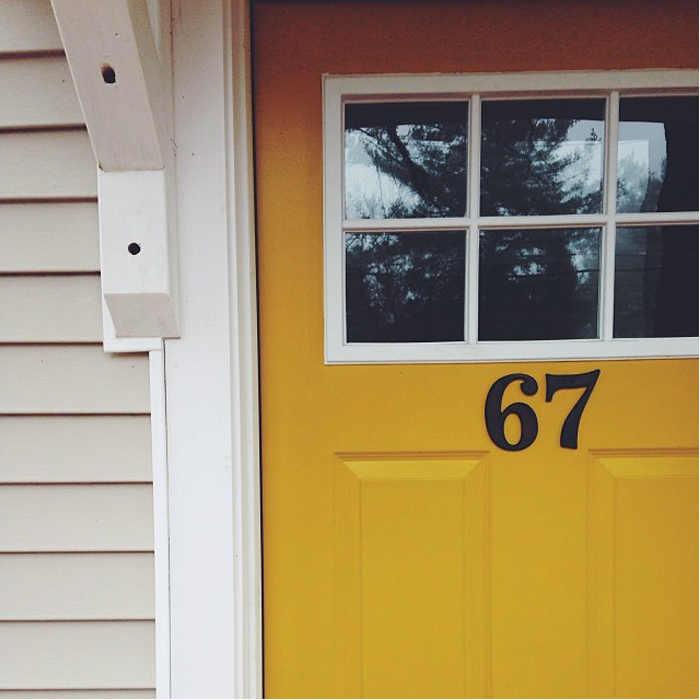 Saying goodbye to our sweet home, and my favorite mustard yellow door. There are lots of funny things about our new house. First of all, it's in a town that I didn't want to live in. My dad will remind me, and keep on reminding me, that I said I would't live here, or buy a house here, ever. That was about six years ago. Ironically, when we started to look for houses this past fall this was the only place I wanted to live. I may have heard people say, a time or two, that no one really moves here, people just stay here forever. Comical that me, my sister, and my parents have all moved here. Also comical, before Caleb and I got married I interned with a wedding and event planning firm. Let's pretend the town I live in is called Greenville. A girl and I were working an auction at the end of a golf and wine event with a lot of wealthy, slightly drunk golfers. Some guy bid on a weekend away and had no idea what he won, thanks to all that wine. When we brought him the envelope with the package he won to Lake Placid, the girl said, Let's tell him he won a weekend away to Greenville. She's all, he's gonna die if he thinks that's where he's going. I'm all, I just moved there. But it's kinda perfect for us. I owe it our real estate agent, and friend, Jeremy for telling us to keep our showing when I wanted to cancel it. If you live in upstate New York and need a real estate agent, Jeremy's your guy. When we thought we wouldn't even sell our house anymore cause our offer wasn't accepted on the first house we wanted, he prayed with us and reminded us that God already knows where we belong, which house we will end up in. How's that for a real estate agent? Thanks for telling us what's up, Jeremy. Email him here. When we first walked into the house I thought we could never afford the remodeling this place needs. The house had so much character and a killer layout. Can you say all the kids upstairs and us on the main floor? Can you also say family room downstairs so that I can shove all the toys into and pretend that my house is clean? Along came this little thing called a rehab loan... we got approved... and what do ya know? It is now our home sweet home. For the next six months our friend and contractor, along with my husband, will be remodeling this beaut. That would be a white brick wall and a working fireplace. Bless the Lord, oh my soul. Beamed ceilings, wainscoting, and lots of light. 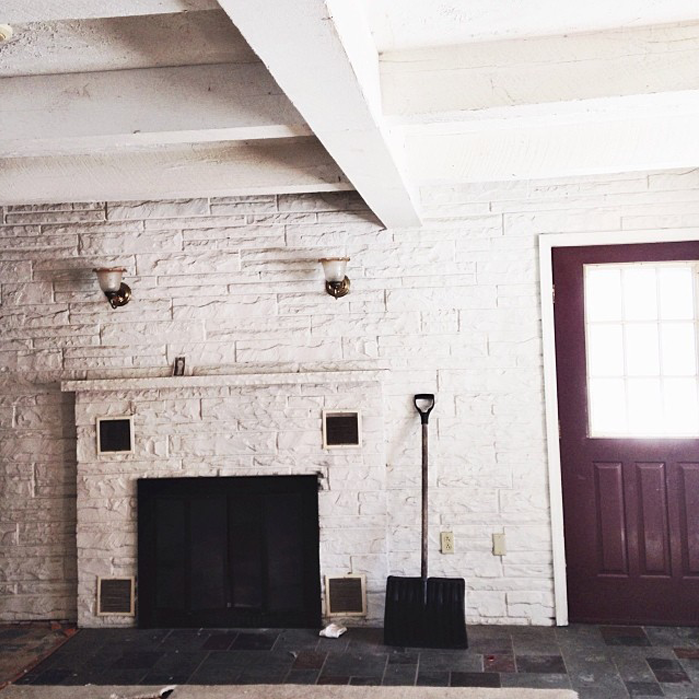 Follow along with our journey to make this house our home. I'll sharing it all here, and bits and pieces on instagram, #burkhouse. Oh, I can only imagine what a wonderful house this going to be when all is "said and done." Looking forward to following along. Do keep us posted! New to your blog! Found you through Camp Patton. Congrats on the house! Can't wait to see what you have planned for it. Im so excited for you! And I learned early on in our marriage never to tell God what I WOULDNT do- I swore to my husband we would NEVER live "back in the valley where we grew up" because I hated it here so much growing up. But having babies and maturing a bit does wonders. We were living in Buffalo when I found out I was pregnant with our first girl and the first thing we decided on was that we would move back home to "the valley." We knew we needed our families' love and support and boy has it been amazing. That house is amazing! It has so much potential!! So happy for all of you! looks beautiful! can't wait to see what you will do! 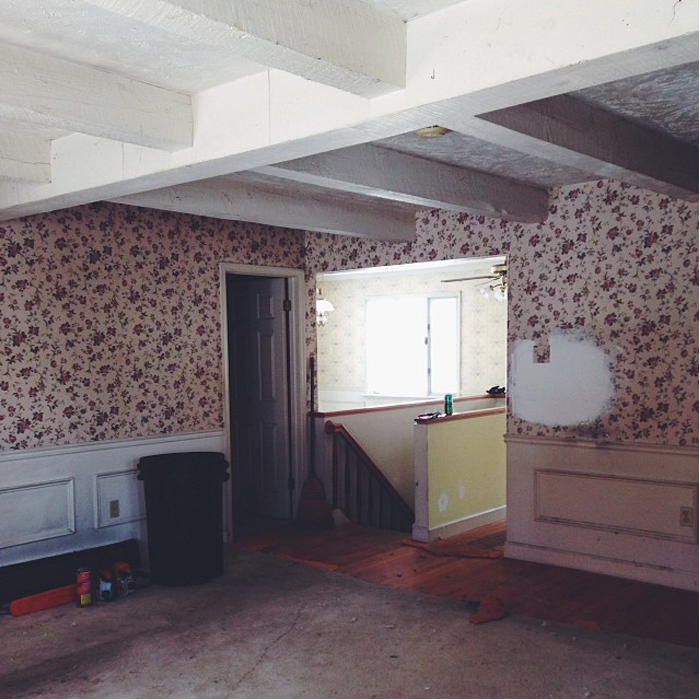 when we bought our second home it was a MAJOR fixer-upper. like people thought we were nuts to buy it, because it was inhabitable. but we gave ourselves a goal of 2 years to remodel it, and we did it- flipped it and sold it! i remember there was a period of two months i didn't have a kitchen sink! i used our bathtub-oh boy! and our third home we had to move in with my dad until our home was ready. we moved in when i was 32 weeks pregnant with our third, had our baby, then moved when i was 4 weeks postpartum. annnnnnd, all that is a blur. but i see God's presence in it all. congrats to you all and the many memories in your new home! Congrats on your new home! Can't wait to see what you do with it. Love homes with character. From what I can see, the house, even in its current state, is beautiful. This post really blessed me! I love to hear how God works things out for His kids. I started following you when you got your littlest babe to see your adoption unfold and now you're rehabbing a house. Love every bit of this lil blog! It has great bones. Can't wait to see what you do with it! I can not wait to see your house turn into a home! What a fun project!! !